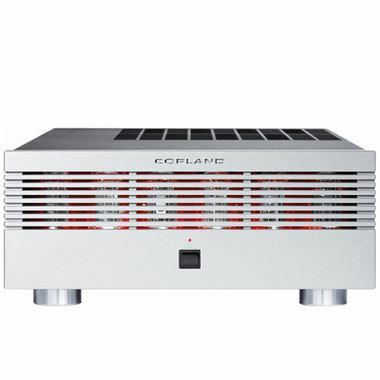 Copland CTA 506 Valve Power Amplifier. Available with Online Finance and Free Delivery. The CTA506 power plant is based on the KT120 power valves. These valves are a new variant of the legendary 6550 / KT88. For more than half a century, the classic KT88 valves have been the foundation of numerous of high quality amplifiers and surely, they will continue to serve as one of the premium choices among manufactures of high-power valve amplifiers. However, nowadays KT120 is one of the most powerful dedicated audio tube in production. In comparison with the KT88, nearly 30% more power can be drawn from these remarkable valves. With a plate dissipation rating of 60W, a pair of KT120 valves in push-pull configuration can deliver nearly 200W of audio power. When used in circuit designs of more modest power outputs, the KT120 can deliver incredible quantity of headroom and dynamic without overloading. The KT120 is an impressive power valve with a long plate structure and huge grid cooling. The Copland CTA506 was among the very first audio products to utilize this new generation of valves. The driver circuits of a high power amplifier are challenged by the increase of current needed to drive the power devices of the amplifier. To prevent excessive loading of the amplifying stages of the amplifier, CTA506 employs efficient buffer circuitries as a method of partitioning the load from the amplifying valves. The buffers are current amplifiers with very low distortion and they do not amplify the signal, they only make it stronger. Another benefit from the use of buffer circuitries is that they allow low impedance DC-coupling between the driver and power valves of the CTA506. The CTA506 push pull output stages consists of a pair of marched KT120 in fixed ultra-linear configuration, providing the power of tetrode valves and the low distortion from triodes. A dedicated power supply for the input stages of the amplifier allows the massive central reservoir capacitors of more than 3000-microfarad to independently serve the output valves. In order to isolate power supply fluctuations of the power stage from entering the input stages of the amplifier, the CTA506 employs active valve voltage regulation. The regulation circuitry employs two pcs. 6550 power valves regulating the voltage for the amplifying and driver stage with only a fraction of deviation from the voltage chosen to operate the valves in this application. The huge power valves in this amplifier are very pleasing to look at; we have therefore decided to make them clearly visible by situating the valves behind lateral perforations on the front panel, thus creating a stunning design to match the sonic virtues of this amplifier.